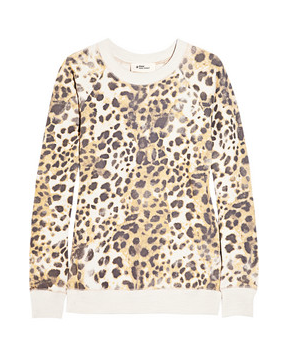 Annnyway, I had my eye on two of Isabel Marant's leopard print tops for the past few months. The first is the Jemet, a silk shirt which I adore and the Warick, a sweatshirt that probably suit my casual lifestyle more. I stalked both items throughout the sale. Much as I love the Jemet, I'm of two minds about hand-washing the fabric and ironing. Does anyone hate ironing as much as I do? The deciding factor was when the sweatshirt was reduced by 70%. I'd ordered the Warick sweatshirt in medium which was loose enough to layer and hide the bulge but still maintain a nice and narrow fit so that I don't look like a puffer fish. The sleeves are cut slightly more narrow than the ordinary sweatshirt in the market. LOVE this feature. Far more flattering that the standard sweatshirt you get from the likes of Adidas or Nike etc etc. The interior lining is thick enough for the colder months but it can be worn in spring as well, thanks to its 100% cotton material. The French just know how to turn the ordinary comfy but bleh sportswear into something really chic and edgy. Just look at what they'd done to the regular track pants. I've worn it out on numerous occasions now. I'm totally digging my newly acquired spots. Even hubby, a steadfast preppy kind of guy was impressed by it. That's saying a lot. Looks like we both got lucky on NAP. I've been stalking both of tops for many months. Like you, I can justify paying £175 for a sweatshirt. I'm stalking Isabel Marant on sale now, but as usual rather too late to get anything. I'd never have looked at this until you pointed out the virtues ! That's what I love about reading a good blog like this ....it opens out new shopping horizons ! Estrella, you're a sweetheart. What a lovely thing to say. Isabel Marant clothes sell out fast. You're probably better off signing for updates. 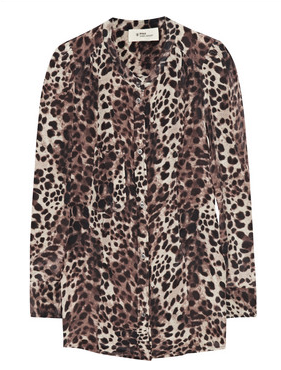 i love animal prints and i love this isabel marant shirts!!! i also wait for sale season but sometimes the time i want to buy no more things i like.. I love a splash of animal print! What a deal! Ooh great deal on the sweatshirt! Did the shirt ever go on discount? I was tracking it for a while but then got tired of doing so and gave up, lol. Kat, the last time I checked, the Jemet was 40% off but I feel that it's still too expensive for a top. I'm very fond of silk blouses but they are pretty high maintenance. Can't wait to see how you style the Warick! Boy I had been missing your blog and glad to be back. I love..love leopard print. They add an instant sassy factor.